For this weeks ‘Food Talk with Mackenzie’ (F.T.W.M) I am going to share with you all my favourite dishes at Ricci’s Tapas & Chicchetti! A great place for lunch and dinner. Ricci’s Tapas is situated at Dean Clough, about 10 minutes from the town centre. It has an outdoor area and a warm, friendly atmosphere. To be honest when you go you won’t even feel like you are in Halifax. 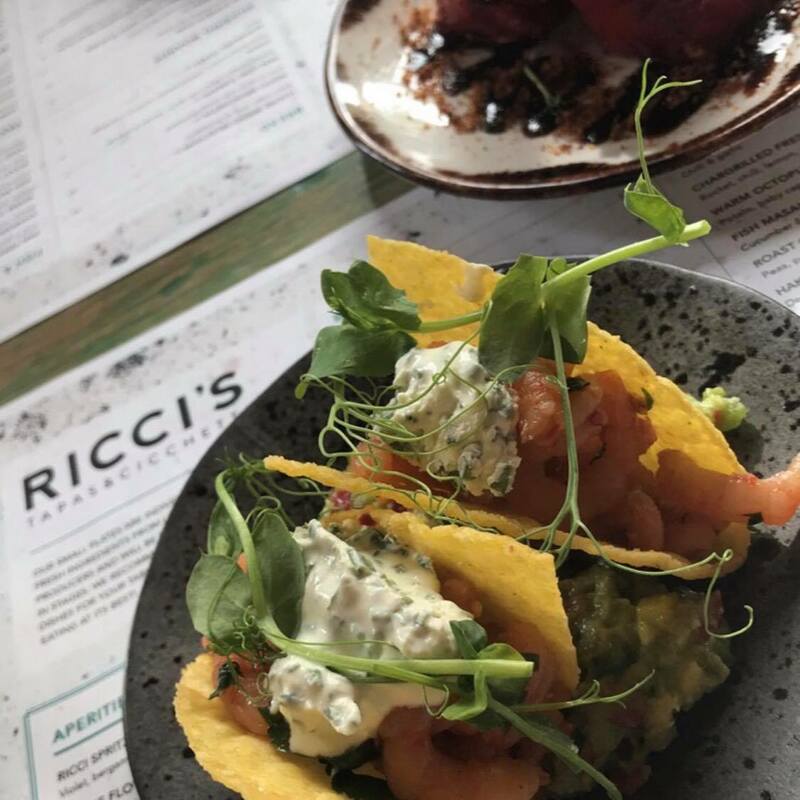 Ricci’s Tapas is only small so if you are going on weekends or in the evening I would 100% book, as it gets booked up really fast. Ricci’s Tapas is a great place to go with a group of friends, girls night, date night and more! There is something on the menu for everyone and with it being tapas it is a great time to try something new. Whenever I go, we either all pick 2/3 different dishes each and share or pick 1/2 dishes and get a sharing board of meat or cheeses. This lets you try a little bit of everything. The small plates of food are packed full of flavour and they may look small, but you will be so full once you have finished! But if you still have room their desserts are great too! It’s really hard to recommend just a few dishes for you guys to try when I love almost everything on the menu, but from my recent couple of visits I have tried a few new things, which I have loved, including their amazing sweet potato wedges served with figs, chilli and goats cheese. On my most recent visit, I tried their new shrimp tacos, which are served cold, but are super light and refreshing, great for a lunchtime. If you are wanting something more hearty, I would really recommend their Mac and Cheese (it is stunning) or their pork and chorizo burger or even the lamb rump. All three dishes are packed full of flavour and will not leave you disappointed! Why not try all three with your friends when you go?! If you go as much as me, there is also a specials menu full of new things to try. So you will never get bored! Now, for something to wash it all down! Their drink selection is as good as their food! From hot drinks, soft drinks such as juices and lemonades to amazing cocktails. I would really suggest trying the Festival Fizz or why not have the usual Pornstar Martini. However if you are wanting something to share amongst your mates their sangria is to die for. Especially their rose or sparkling one, packed full of booze and fruit, what more could you want. Hope you enjoyed my review and let me know your opinions of Ricci’s Tapas in the comments! Every Friday at 5pm expect some great reviews, good or bad, of all the places I go to.